The layout of the photo station is critical to creating the best possible digital slabs. A correct photo station setup will produce digital slabs that are consistent and accurate in both dimension and color. The diagrams below illustrates some of the key dimensions required to achieve this goal. Download or view: Photostation Layout (pdf 3.9MB) - ( Right click and select "Save target as..." to save to your computer. Download or view: Slabsmith™ Photo Station Layout (3D) (pdf 8.42MB) - ( Right click and select "Save target as..." to save to your computer. The easiest way to determine where the lights are pointed is to use two people. First get two step ladders for the higher lights. One person will position the light. 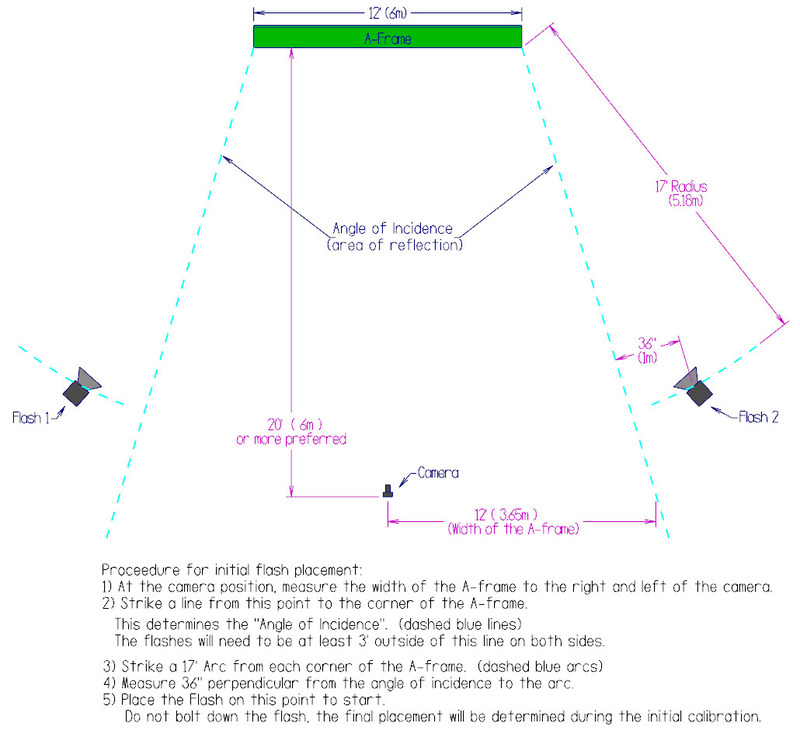 Person 2 will look at the light while person 1 adjusts the light position. When the center circular flash tube is centered in the silver reflector the light is pointing at that spot on the A frame. There are many factors that must be considered when planning where you will set up your photo station. Your work flow, ambient light changes (ie- garage doors, skylights), and a correct photo station setup. In almost all cases it's difficult or impossible to dedicate an area completely to the Slabsmith™ photo station. For this reason it's important to use a little creativity when deciding where you wish to place the photo station. Look for work isles where you can place the A-frame on one side of the work isle, and the camera and lights on the other side. This type of a layout will allow for the requirements of the photo station without preventing the use of the work isle. You can do things like place the A-frame against the back of a machine, while placing the camera on a wall. Remember the camera can be as much as 27 feet away from the A-frame when using the recommended camera and lens! It's also a good idea to consider your work flow. Where do the slabs enter your building. If you are able to place the photo station in the same area, there will be less handling of your slabs. Also look for potential sources of large ambient lighting changes, for instance, a garage door. If you have a door near the A-frame, and you can not keep it closed during the times you need to photograph slabs, you may want to consider a different location.